From February through July 1912, All-Story Magazine serialized Under the Moons of Mars, an epic pulp adventure loosely inspired by the Mars-is-dying speculations of astronomer Percival Lowell - and perhaps a bit more than inspired by Edwin Lester Arnold's 1905 Martian romance, Lieut. Gullivar Jones: His Vacation. It was Edgar Rice Burroughs' first attempt at fiction; worried about what his colleagues might think, the pencil-sharpener company manager published it under the pseudonym Norman (Normal) Bean. By 1917, Burroughs' Tarzan franchise was wildly popular, so the publisher A.C. McClurg reissued his tale about John Carter's triumphs and tribulations on Barsoom as A Princess of Mars — the single most influential "planetary romance" novel in the genre later dubbed "science fiction." 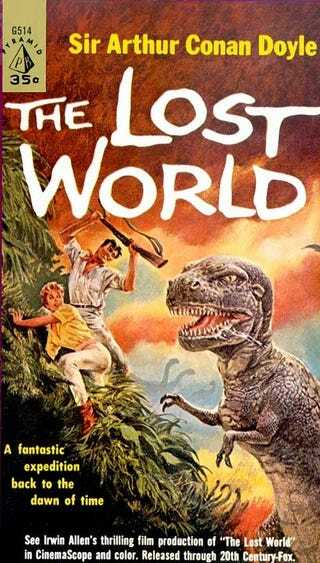 In England, that same year, Arthur Conan Doyle, whose Sherlock Holmes stories had revolutionized crime fiction, published The Lost World — in which the brilliant scientist Prof. George E. Challenger and companions journey to a South American jungle, where they discover a high plateau crawling with prehistoric monsters and beast-men. This was science fiction's first popular dinosaurs-still-live tale; everyone from Edgar Rice Burroughs (The Land That Time Forgot) to Merian C. Cooper and Edgar Wallace (King Kong) to Michael Crichton would follow its lead. Challenger would star in four of Doyle's subsequent scientific romances: The Poison Belt (1913), The Land of Mist (1926), When the World Screamed (1928), and The Disintegration Machine (1929). Back in the United States, in March 1912 Hugo Gernsback's scientific hobbyist's magazine, Modern Electrics, finished serializing the editor's first novel, Ralph 124C 41+: A Romance of the Year 2660. Ralph One-to-foresee-for-one (get it?) is a brilliant inventor- but forget about him. The only thing that Gernsback, who in the 1920s would become a pioneering SF magazine publisher (the Hugo awards are named after him), cares about is showing off the technical marvels he's dreamed up — his accurate predictions include television, microfilm, and radar. Gernsback's novel was a grown-up version of the "Edisonade" subgenre of SF: for example, Tom Swift and His Air Glider, Tom Swift and His Wizard Camera, and Tom Swift and His Great Searchlight, all of which also appeared in 1912. Tom Swift, Professor Challenger, and Ralph 124C 41+ may have been staunch advocates of scientific progress, but on April 14th, 1912, the technologically advanced ship RMS Titanic struck an iceberg and sank; this gave pause even to the era's techno-futurists. Coincidentally, several of pre-Golden Age science fiction's best post-apocalyptic and dystopian novels were published in 1912. These include: The Vacant World, the first part of George Allan England's Darkness and Dawn trilogy, in which two modern people wake up a thousand years after the Earth has been devastated by a meteor, and set about rebuilding civilization; The Second Deluge, astronomer Garrett P. Serviss' thrilling adventure story in which complacent scientists, scheming public officials, and capitalist robber barons get their comeuppance after failing to heed a modern Noah's warnings about an apocalyptic flood; and William Hope Hodgson's The Night Land, which is set on a frozen future Earth whose human inhabitants live in an underground redoubt surrounded by Watching Things, Silent Ones, Ab-humans, and other monstrous invaders from another dimension — and whose proto-Skywalker hero taps into a Force-like energy and bears a lightsaber-ish "Diskos." As if the preceding examples weren't evidence enough that 1912 was a critical year for science fiction, I feel compelled to mention three lesser works also worth checking out. Rudyard Kipling's As Easy as A.B.C. shows an anti-imperialistic side of the author of "The White Man's Burden"; it's set in a future world dominated by an international Aerial Board of Control that ruthlessly attempts to maintain law and order. Le Mystérieux Docteur Cornelius, by the always-thrilling French SF author Gustave Le Rouge, pits an alliance of heroes against the Red Hand, a mad-scientist-led criminal empire. And in Le Péril Bleu, by the French SF author Maurice Renard, invisible aliens who lived in the upper strata of the atmosphere fish for humans and keep them in a space zoo. Finally, British author Sax Rohmer's Chinese master criminal character, Fu Manchu, who would inspire racist depictions of SF's Asian villains from Ming the Merciless to Dr. No, first appeared in the 1912 story "The Zayat Kiss." Joshua Glenn is a Boston-based journalist, editor, and cultural semiotics analyst. He cofounded the websites HiLobrow and Significant Objects, and writes about Radium Age science fiction for io9.